The end credits of Viceroy’s House reveal an extraordinary connection between the events depicted in this movie, and the film’s British-Asian director Gurinder Chadha. I won’t reveal what the exact connection is, since it is literally the very last thing seen in the movie, but it makes this film a very personal one for Chadha to be heavily involved in, and her passion for the subject and its brutal real-life consequences shines through in her film, which is a fascinating but bittersweet exploration of a significant time in 20th century history in India. It is set in 1947, when the British Empire has announced that they will be receding from power in India after three hundred years. Lord Mountbatten (Hugh Bonneville) has been chosen to be the last Viceroy of India, and so travels to the stately mansion with his family, including wife Edwina (Gillian Anderson), to oversee the transition of power, which includes heavy negotiations with several leading Indian figures of differing Hindu, Sikh and Muslim faiths, among them Mahatma Gandhi (Neeraj Kabi), and also Muhammad Ali Jinnah (Denzil Smith) who is heavily pushing for a Muslim-majority state to be known as Pakistan. Meanwhile, there is a romance sub-plot between two Indian workers at Viceroy’s House, Jeet (Manish Dayal) and Aalia (Huma Qureshi), who are both caught up in the political climate of the moment and are desperate to not let the pursuing Partition of India separate them. The feel and scope that Chadha is clearly aiming for with this film is that of a historical epic in the same veins as Doctor Zhivago, Titanic and – appropriately enough – Richard Attenborough’s Gandhi, albeit on a somewhat smaller scale in comparison. Nowhere is that more apparent than with the inclusion of the romantic sub-plot, which attempts to blend fact with fiction not unlike at least two of those other movies, and in doing so coming across more as a traditional Hollywood film about the subject instead of something based more on fact, like the kind of docudrama which Chadha – a former BBC journalist – has some experience in. It is also, however, such a traditional historical romance that you can spot a few of the clichés coming a mile or two away, and despite the two actors’ likability and smooth chemistry, their sub-plot unfortunately ends up being the weaker half of the movie, so much so that whenever the film breaks away back to them, it feels like another, slightly less interesting movie has just taken over. The other half of the film – and thankfully more of its focus – is centred around the heavy negotiations of how best to hand India back its power, and with Mountbatten dealing with all these major figures in order to come to the best compromise to better secure the soon-to-be-divided country. This is easily the most fascinating part of the film, because it’s giving us an account of history that is seldom talked about or taught in schools, and it’s interesting to learn about as well as entertaining to actually care about what the outcome may be, even though most of us know what it is. It’s also refreshing to see certain figures like Jinnah, often depicted in the media as a villainous caricature, be portrayed here not necessarily as the bad guy but just one of a few people wanting the best deal for their people; Mountbatten too, who is again usually a despised figure in certain media depictions, is someone with very human attributes here, and Bonneville does some strong work showing his character’s vulnerability and well-intentioned diplomacy eventually get the best of him. Aside from a late reveal involving the Radcliffe Line, there are no real villains in this situation, just a bunch of people trying to come to some form of agreement, and that was something I felt was a fresh take that a film like this needed. 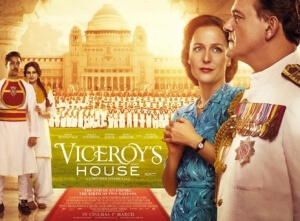 Think of Viceroy’s House as a history lesson where the teacher went all out to make the learning experience as entertaining as possible for the class, even if they had to add a certain Downton Abbey/Upstairs Downstairs level of drama to get their attention. Luckily, that history lesson also contains information about a time that really should be studied about more often, not just in schools but higher classes of diplomacy and international relations. It was honestly fascinating seeing these events unfold, especially under our current political climate where headlines about refugees and intolerance towards Muslims dominate the news just as it did back then, and I applaud Chadha for bringing to light a major milestone in 20th century history, though I hate the fact that it took me until my mid-twenties to learn about this story in a cinema instead of at school when people should at least have the luxury of knowing this was how it once was. If anything, on top of it being a rather excellent and insightful look into these events, despite a few missteps like that wildly exaggerated and honestly unneeded romance sub-plot, Viceroy’s House is a reminder of just how vital the subject of history is to all of us, and how without it we can’t be reminded of what happened that led us to where we are at this moment in time, nor can we learn from our past mistakes to create a better future. I do highly recommend checking it out if you, like me, are interested in learning more about a slice of history you hardly knew ever existed. Viceroy’s House is an excellent and insightful look into the last days of British rule in India, always remaining interesting and entertaining, and despite a few missteps like a romance sub-plot that is a little too traditional and superfluous to everything else in the film, it truly brings to light an era of history which sadly is not taught that much in schools, and encourages people of all ages to learn more about this major milestone in British and Indian history.